To commemorate the 150th anniversary of Abraham Lincoln’s death, AOC Curator Barbara Wolanin details the days he lay in state at the U.S. Capitol. President Abraham Lincoln's body lay in state in the center of the Rotunda of the U.S. Capitol from April 19 to April 21, 1865, in an open coffin resting on a trapezoidal wooden bier draped in black. The structure, called a catafalque in French or catafalco in Italian, was used for the funerals or lying-in-state of distinguished persons. Amazingly, the wooden catafalque, recovered numerous times and used to hold many other coffins, has been preserved. It is now on view in Exhibition Hall of the Capitol Visitor Center, except for times when it is brought up to the Rotunda to serve its purpose. Arrangements to mourn President Lincoln had to be made very quickly following his assassination in Ford's Theatre on the evening of April 14 and his death early the next morning. His body was quickly taken to the White House, where it would lie in state in the East Room on a 15-foot high catafalque topped with a canopy; that structure was not saved. 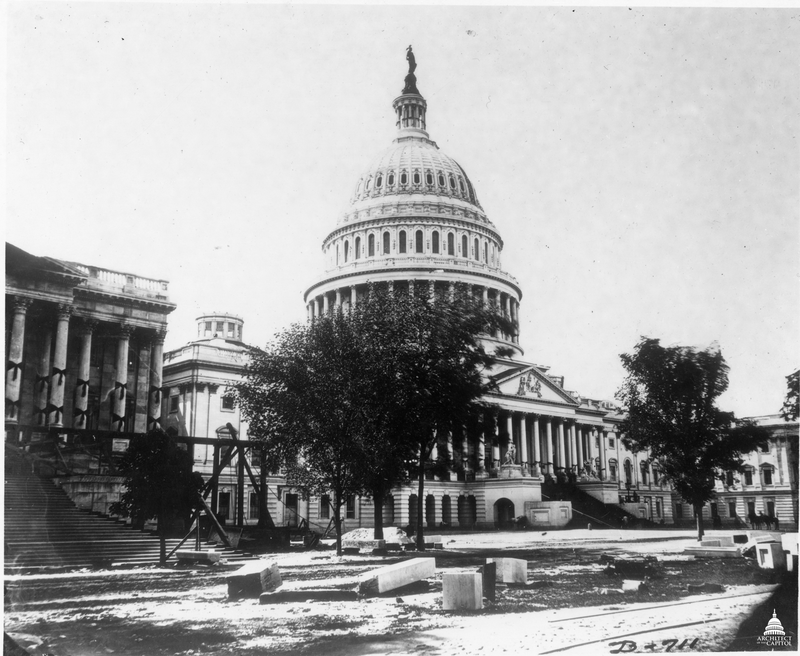 As soon as Commissioner of Public Buildings (appointed for a second term by President Lincoln in 1861) Benjamin Brown French heard the horrific news, he closed the Capitol and began to prepare it for the funeral. He gave directions for "clothing the Capitol in mourning" with lengths of black cloth. He ordered the construction of a catafalque or bier. Following a design by French's twenty-year-old son, Benjamin Jr, a Mr. Job W. Angus and others nailed together pine boards to create a 7-foot-long platform, set on an 8 ½-foot-long base. French wrote that the covering was "made and trimmed by the hands of my wife." As described in The Evening Star and Daily Morning Chronicle on April 20, 1865, the “fine black cloth” was edged with silver fringe and fastened with silver stars. At each corner were "union columns," in the form of fasces, bundles of rods tied with silver lace. On either side were arranged pairs of guns, swords, and bayonets. In the Rotunda, Capitol employees covered the walls, the eight large paintings, the marble statue of the Dying Tecumseh (now in the Smithsonian American Art Museum) and other statues with black cloth. Only the statue of George Washington, a plaster copy after Houdon, fitted with a black sash in the style of military mourning, was visible. At 2 p.m. on April 19, after the noon funeral ceremony in the White House, the coffin was placed in a funeral carriage, led by a procession of 30,000 composed of military units starting with the Twenty-Second United States Colored Infantry, government leaders, and citizens marched down Pennsylvania Avenue to the Capitol. To the sound of a dirge, the pallbearers carried the coffin up the east central steps into the Rotunda and onto the catafalque placed in the center, with the head of the coffin to the west. After a brief funeral service attended by prominent persons and those close to Lincoln, led by Lincoln’s pastor, Reverend Phineas D. Gurley, at 3:30 p.m., baskets of flowers were arranged around the catafalque, with an Honor Guard watching over it. The next day, an estimated 25,000 to 40,000 people from all over the country paid their respects. The Sunday Star reported: "All day there has been one continuous stream of human beings going up the steps of the East portico and to the rotunda . . . the crowd passing through at the rate of 3,500 per hour." As they entered, the mourners were arranged in a double line that divided to walk around either side of the catafalque to view the fallen president. Noah Brooks, author of Washington in Lincoln’s Time wrote: "While this solemn pageant was passing, I was allowed to go alone up the winding stairs that lead to the top of the great dome of the Capitol. Looking down from that lofty point, the sight was weird and memorable. Directly beneath me lay the casket in which the dead President lay at full length, far, far, below: and, like black atoms moving over a sheet of gray paper, the slow-moving mourners, seen from a perpendicular above them, crept silently in two dark lines across the pavement of the rotunda, forming an ellipse around the coffin and joining as they advanced toward the eastern portal and disappeared." There are no known photographs or drawings of this lying in state, but some photographs exist of the Capitol draped in swags of black cloth. Lincoln's casket was removed from the Rotunda at 6 a.m. on the morning of April 21, after a brief service attended by General Grant and members of Congress. The coffin was taken to the nearby Baltimore & Ohio Railroad station and placed on a train bound for Springfield, Illinois, along with the exhumed casket of his son Willie, who was buried with President Lincoln on May 4 after a final lying in state and funeral. B.B. French allowed the cloth covering the catafalque to be taken with the remains, but asked for it to be returned. He wrote to Major General Montgomery C. Meigs on April 21, 1865: "It is my intention to have the mausoleum, intended for the remains of Washington, beneath the Crypt of the Capitol, thoroughly cleaned and properly fitted, and to place in it the Catafalco on which the body of our late beloved President lay in the rotunda, there to be preserved as a memento." 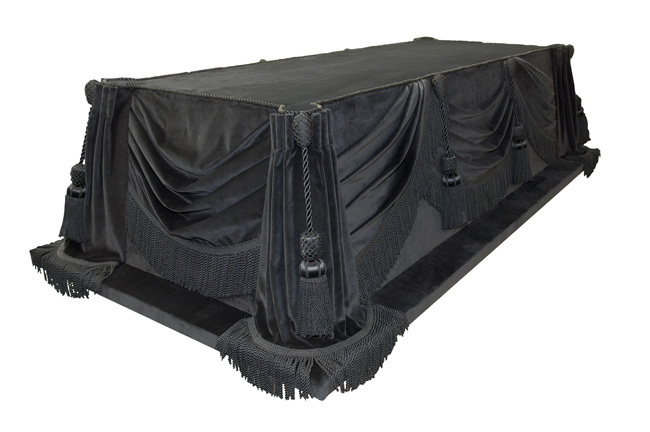 Following the precedent set by Lincoln's lying in state, the catafalque has been preserved and honored, used only to hold the coffins of presidents and others deemed by the Congress to be worthy of laying in state in the Rotunda, or used in the Supreme Court for Justices. Although the black cloth has been replaced many times and some of the wood structure reinforced, the pine boards forming the catafalque are those that held Lincoln’s coffin. How honorific - and in it's time - how audacious it was for those who so hastily planned the funeral of Abraham Lincoln, that they han the sense of history to give a Black Army Regiment - The Twenty-Second United States Colored Infantry - the honor of leading the procession which conducted The Great Emancipator to the recently-completed U.S. Capitol, where he would be the first dignitary to Lie in State beneath its Rotunda.